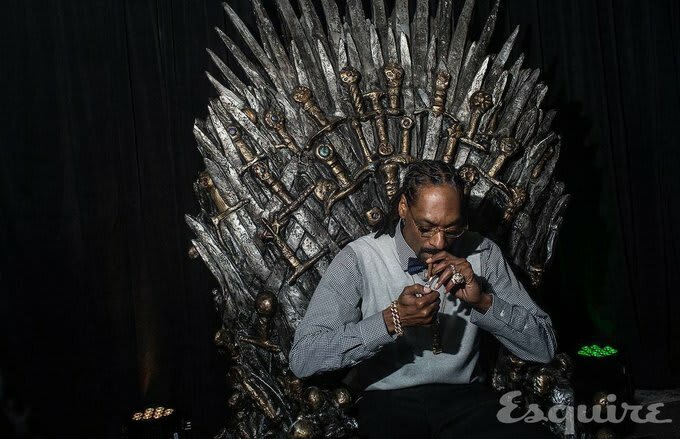 Of all the co-branding stunts taking place at South by Southwest this week, it will be hard to shake the mental image of Snoop Dogg smoking a blunt while sitting on the Game of Thrones throne. Or, many blunts. [...] Snoop danced. He laughed. He posed for pictures with sleepy eyes and gray hair poking out near the top of his dreds. He didn&apos;t say a word or speak into a microphone. A woman handed him a glass of red wine; he danced some more. His bodyguard—roughly 7 feet tall and 300 pounds—kept people just out of arm&apos;s reach. Then Snoop took a few more hits, smiled, and kept dancing." Surely a good time was had by all, especially GoT nerds (although this throne is just a replica—the real thing is in Belfast) and Snoop himself. The exclusive hangout and incredible photo–op took place at the Red Room bar in Austin on Friday. Earlier that day, Snoop announced that he will executive produce an HBO series with Menace II Society director Allen Hughes. The series will take place in Los Angeles in the 1980s. But could it really be any better than a Snoop Dogg story arc on GoT? Let&apos;s hope this event just the first to come.